Total Battle is a game that has some strong base building and economy management aspects while also providing a rich and in depth battle simulation. 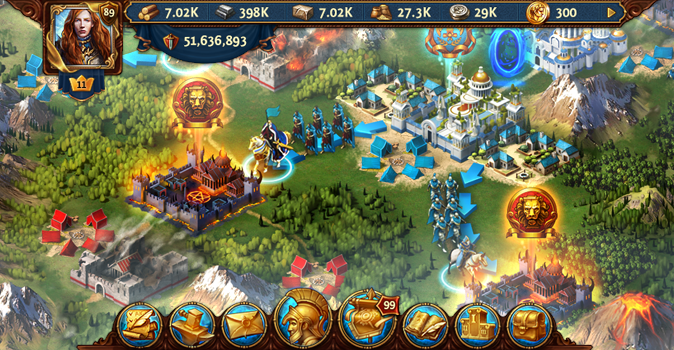 Expand your base, build a thriving city and defend your walls from envious neighbors and monstrous invaders. Lead your settlement from the nothing to a flourishing city that not only has the most advanced economy but also the strongest military in the whole empire. 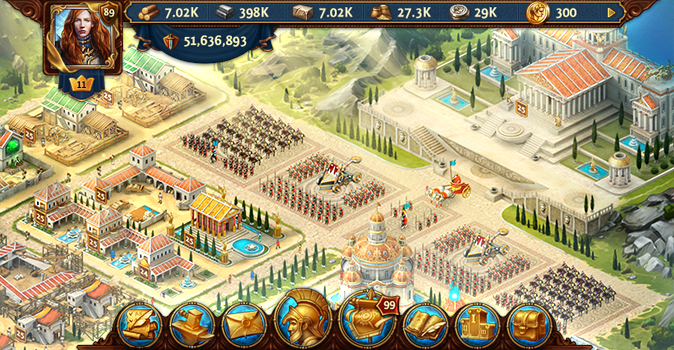 Lead your armies to victory and conquer your foes in this epic strategy game. Before you can even think about things like massive battles, you need to take a minute and think this through. Who is gonna fight for you when you have no means to pay your soldiers? Who is going to risk his life for nothing? Exactly. Not many will do and that is why it’s super important to give your soldiers glittering coin in return for their services. How to obtain such coin? Well, there are several ways to do this but the most reliable is simply by turning your little hamlet into a prospering capitol with a strong economy. In order to do that you can assign work orders that will eventually lead to the construction of foundries, farms and trading posts. 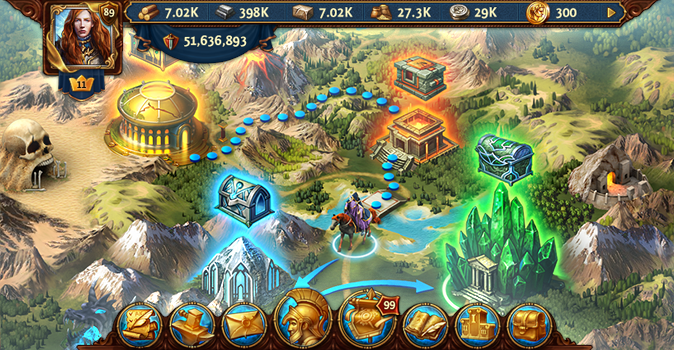 These structures will continuously produce gold, crafting materials and other useful resources that will help you to finance your upcoming wars. Only those who have a strong economy, will be able to maintain an equally strong army. From swordsmen to rogues, catapults and even mythical monsters, Total Battle is a game that has a very wide and versatile unit roster, allowing for interesting army compositions. Needless to say though, that initially you won’t be able to recruit flame spewing dragons and alike but that’s ok in the beginning. A solid infantry core will be sufficient for your initial brawls and raiding parties. Once you build and upgraded the barracks and corresponding structures an ever-expanding roster of unique units will become accessible, where each unit has its strengths and weaknesses. While siege weapons for example are pretty good at sieging (who would have guessed? ), they usually underperform when confronted with mobile units such as cavalry and alike. Here it will be up to you to forge an army that can adapt to most situations and overcome even the toughest foes. What use has an army that is only sitting within your city walls? Once you managed to hire your first units, you can send them out into the empire to fight nearby monster camps or even raid your rivals. The latter can be quite rewarding since stealing a ton of resources off your opponent will not only hinder his or her growth but also boost yours. Be warned though that raiders usually live a dangerous life and those who make a habit of raiding their neighbors will eventually have to deal with retaliation strikes. 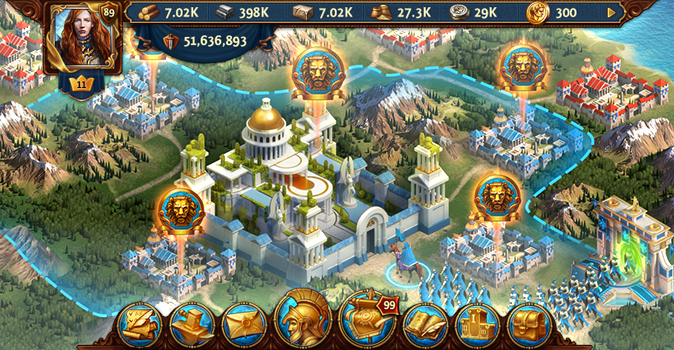 This is when it will pay off to have powerful friends or alliances on your side, providing protection through numbers and ensuring that your resources stay within your city walls. Free-to-play: Just sign up once and you are good to go. Total Battle is absolutely free-to-play. Build a strong economy: Expand your own city and rise a robust and profitable economy within your city walls. Dozens of units: Hire dozens of different units, each one having its own strengths and weaknesses and build a versatile army to overpower your foes. Raid and plunder: Raid rival cities to provide a surplus of resources for your own growth while hindering your rivals in expanding. Total Battle is a classic mix between a strategic battle simulation and an economy simulation. While this game doesn’t reinvent the wheel, so to speak, it does a great job at being what it is – a well-crafted piece of free to play software. The economic simulation is down to the point and not overloaded with needless gimmicks and bling whereas the combat part of Total Battle is crisp, diversified and that even in the long run. 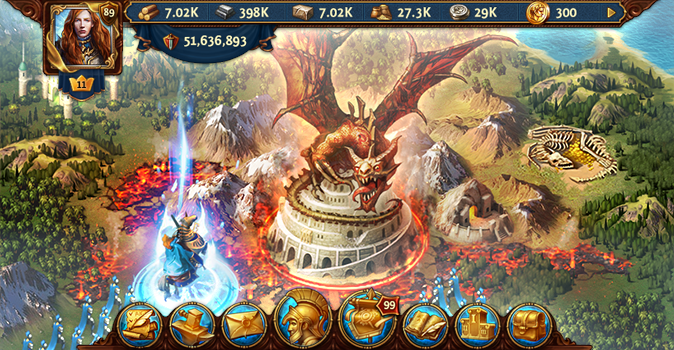 The unit roster is a nice mix between ancient units and mythological creatures alike. It’s also a good thing that each of those units has a specific purpose on the battlefield, resulting in a more though-out combat system then you might think at first glance. All in all though Total Battle is definitely a game we can fully recommend.